At 3PL Center, we provide both public and contract warehousing. We also offer flexible warehousing solutions at competitive prices. Every customer has unique requirements, and that’s why we do not provide cookie-cutter solutions. When you work with us for your warehousing needs, you can rest assured that our business is structured in a way that allows us to handle all your needs no matter how challenging, unique, or diverse. 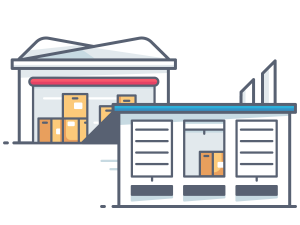 If you have multiple customers that need served in a particular region, 3PL Center can act as your middleman. If you ship to us in bulk, we can breakdown your truckload shipments to bite-size quantities for your individual customers, while keeping handling, storage, and transportation expenses low. Warehousing is the process of storing goods within a storage facility; it is suitable for both personal and commercial use. These warehouses are focal points for product and information flow between sources in a supply chain. Warehousing is often a necessity for customs, transport businesses, wholesalers, exporters, importers, manufacturers, and more. Modern warehouses are equipped with loading docks designed to ease the process of loading and unloading trucks. What’s more, forklifts and cranes are used to move supplies. Warehousing sees the handling of a myriad of stored goods, including spare parts, packing materials, raw materials, as well as finished goods associated with production, manufacturing, and agriculture. Why Should You Choose 3PL Center for Warehousing? For starters, 3PL Center has combined experience of more than 45 years in the warehousing industry. We provide an array of third-party logistics services, including warehousing. We operate premium-level warehousing facilities as well as the latest warehouse equipment. Our experienced team of warehouse employees can facilitate a powerful supply and distribution chain for your business. What’s more, all our warehouses are protected via a robust security and fire protection system. With pest control measures in place and our compliance to environmental, insurance, and safety requirements, you can enjoy absolute peace of mind. When it comes to warehousing, we have a consistent track record of maintaining order accuracy. Whether you are seeking standard in and out warehousing solutions or bulk and rack storage solutions, we’ve got you covered. We support new production introduction, seasonal merchandise distribution, product overflow (in your current storage facility), regional distribution, plant expansion (or support), disaster relief, and more. We continually strive to be an efficient 3PL warehousing partner; no project is too small or too big for us to handle. Ready to Get Started with Warehousing? To find out how your business can benefit from our stellar warehousing capabilities, do not hesitate to email us at sales@3plcenter.com or call us at 732-391-2500 today.